We didn't actually say "It's a fixed gear, dammit" but that's what we meant. These freewheelers--can't they tell when a bike is fixed? The Heartland Races take place around Kansas City, Missouri, USA. There's a children's class, a beginners' class, a sport class, a clydesdale class, an expert class and--most importantly for this story--a singlespeed class. That's the one I entered with my friend Jason. Both of us figured that our fixers would be considered as singlespeeds. We'd built 'em for the Kansas City area. 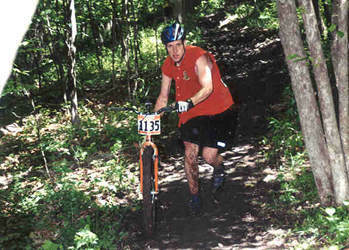 Our local singletrack, on old limetone, has tight turns and a hint of smooth technical flow. Our trails, mostly in thick woods, overlay that same limestone with a loess soil mixture and roots. There are multiple climbs and descents, anything from 5 to 75 feet. To handle all this, we had chosen Gunnar Ruffians, tough 26" frames with ridged forks. We geared between 48 and 52", big enough not to spin out on the flats, small enough to get us up 90% of the hills in a 100 mile radius. We fitted high-rise bars and thick tacky Oury grips for fluid moves among the trees and rocks. We threw fat tires up front and topped off with Cane Creek Thudbuster suspension posts and leather seats. We were going to need 'em all. 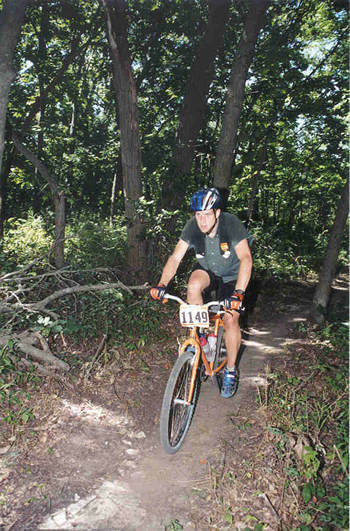 For 2002, the Heartland courses were all within a 90 minute drive of downtown Kansas City, but they took in some of the finest singletrack in the midwest. And they were cannily timed to expose riders to every climatic condition the region has to offer--everything from the muddy hypothermia of March to the still-air heatstroke of July. Most courses were five to seven miles long. Depending on the race class, a rider might be required to complete anywhere one, two or three laps. Most classes had ten riders or more, split into men's and women's races, so each race event attracted 200+ racers. We got a hundred or so spectators, too. So, how was it to ride this stuff on a fix? Well, most of the time, it gave us an advantage. That direct link to the rear wheel provided improved sensitivity and control. We found we could monitor the trail conditions without taking our eyes off the course. With practice we learned to process feedback from our butts, our feet and our hands while we were riding, letting us concentrate our focus on passing the rider ahead. Fixin' is good for the brain. But it definitely has its disadvantages too. On non-technical descents, the freewheelers were all over us, of course. But we also found that our margin for error was cut to zero. Let me explain. When things go wrong, a fixer has but two options: straight on, or veer off. Freewheelers get a third option--anchors out! It's their favorite. They do it all the time. We had to keep our eyes on the riders around us, monitoring feet, rear brake and saddle positions. If we didn't, we were likely to find ourselves in a shunt. Do I have any advice for others looking to try it? Sure, a few things. Start hard. Sprint off the line. Keep a strong, smooth cadence and get those elbows out! Anything less and you're gonna eat dirt big time. Stay straight. Turning out of your line is an emergency measure. Stopping is not an option. If your cranks hit a snag, follow through and deal with it. Your momentum will get you through most situations. Stop soft. If you break a chain, stopping may be difficult. Do what you have to do. How did we do? We placed pretty well: me 2nd, Jason 4th. We stretched the laws of physics to a gratifying extent and we entered into relations with four different offroad courses, relations intimate enough to make any spouse jealous. Am I gonna do it again? If you'd asked me that the morning after a race, any race in the series, I'd have said 'No'. My knees hurt, and they went on hurting whenever I bent them for at least 24 hours. It was enough to make me swear off another season. But, like all hangovers, the bad knees wore off. And, like all the others who swear off something the morning after, I'll probably end up breaking my promise. I'd race fixed again. But there are some stipulations. I'd have to change the bike. I'd add front suspension and a rear brake in hopes of taking some of the strain off my knees and upper body. But the clincher is to do with the race organization. I don't want to race against freewheel bikes again. I want to see a fixed-gear class. Maybe that's a pipedream. But riding our fixes in the Heartland Series taught us many things about cycling that we couldn't have learned any other way. If they made a fixer class, maybe others could learn them too. Wade Frerichs lives in Kansas, and rides fixed a lot. When not racing, he likes hi-rise bars. Photos © 2002 Robert L. Stitt and Heartland Sports Promotions, used with consent. The Heartland Series has its own site. Jim Smart is another avid racer using a fix.